Serial Port Monitor (SPM) is a powerful Modbus sniffer tool serving as an optimal solution for analyzing data transferred within Modbus communications. Thanks to SPM’s outstanding functionality, you can easily detect and resolve any problem you may face when providing Modbus testing and debugging. The distinctive advantage of the software is its ability to display and log all the data transmitted through COM ports available in your system. With the advanced search and filter options, offered by this efficient Modbus sniffer software, only relevant serial data will be shown to you. Another great SPM’s feature is a built-in terminal used for executing text commands. Serial Port Monitor is an easy-to-use app that supports different formats for exporting data and provides you with numerous significant options. The moment SPM connects to the required COM port, it starts analyzing serial data transferred through it. By monitoring serial ports in real time, you can track down emerging issues and react immediately. Even when a COM port is used by another application, you’ll still have no problem connecting to it with the software. All data, collected by SPM, can be viewed in different modes, which greatly simplifies the process of data comparison and evaluation. In addition, Serial Port Monitor can work as Modbus RTU sniffer. SPM is capable of recording data from several COM ports within the same monitoring session. That means, you can see several applications communicating with different devices through several serial ports simultaneously. Using the first in, first out method for data logging, the software makes it easy to analyze monitored communications. Captured data can be displayed in different visualizations. 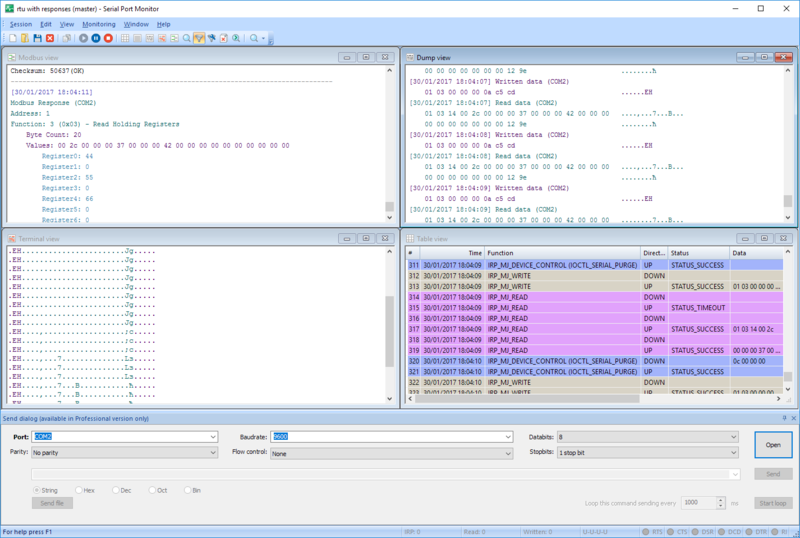 The software offers Line, Table, Dump, and Terminal views. Each visualization provides its own benefits, so, depending on your needs, you are able to choose whether to watch the data as recorded IRPs, displayed in a table, ASCII characters, or a plain text, displayed in lines. If you want to test the reaction of a particular device to a specific command, SPM will help you do this by simulating sending data to the required device from the monitored COM port the device is connected to. The software supports binary, octal, decimal, hexadecimal, and mixed data formats. It’s a really good idea to compare monitoring sessions if you need to get more accurate results within Modbus communication being analyzed. Once you receive Modbus data from your application, SPM enables you to emulate its transfer to the serial port again. This way, you can see all differences between sessions and compare the data received. Flexible configuration options: stopbits, flow control, parity control, data bits, highlighting, etc. Exporting and automatically redirecting monitoring sessions to a file (HTML, ASCII text, UNICODE text, Exсel CSV).